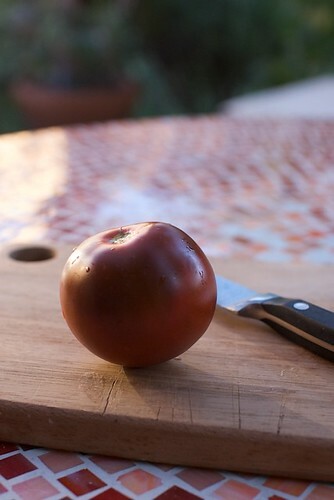 I picked my first tomato off my tomato plant today. It felt a little soft and it certainly smelled ripe. I was a bit unsure because it was so small, but I guess the Black Prince variety of tomatoes can run on the smaller side. It was juicy, savory, and not really that sweet. The skin was thicker than I expected, but the inside was delicious. I hope my little tomato plant produces a lot more! 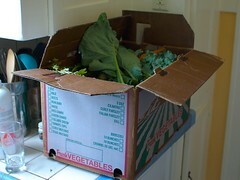 I picked up my very first box of CSA goodies from Atwater Farmer’s Market this morning. 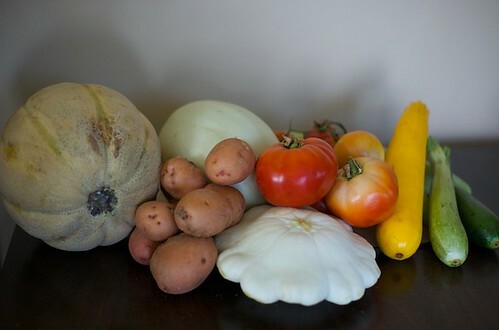 I had ordered a box from South Central Farmer’s Coop CSA early this week and scheduled to pick it up on Sunday so that we could have fresh veggies to cook with during the coming week. 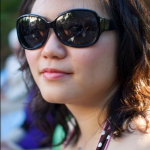 What really drew me to this CSA was that I didn’t need to subscribe for a certain number of weeks so there was no commitment for following weeks. All I did was go on the site, sign myself up for the week, choose a payment option ($15) and a pick-up spot. They seem to have one at almost every farmer’s market throughout the week all over LA, which is convenient. This week’s box was very heavy because there was half a watermelon, a cantelope and a honedew in it. I love melons! There’s already a portion of the watermelon chilling in the fridge in the form of a watermelon aguafresca. 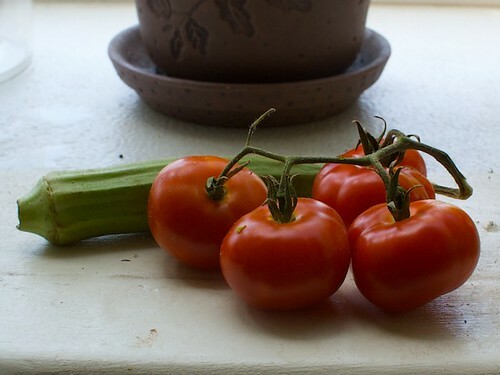 Since my home-grown tomatoes aren’t ripe yet, I was happy to see tomatoes in the CSA box. There were a couple of tiny baby ones smaller than okra! 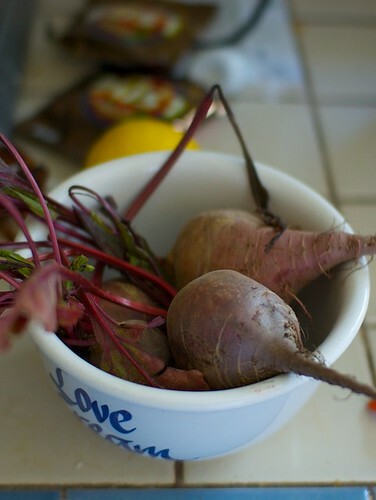 We also had a handful of beets, which we’re gonna use for a beet salad tonight for dinner. I’m hoping that getting veggies from the CSA every couple of weeks means we cook a lot of different types of dishes instead of the same stuff over and over again. 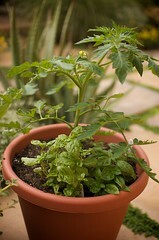 It’s only been 10 days but my little tomato plant is really taking off! 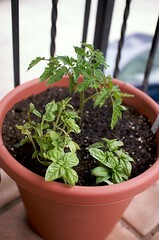 Not to mention the two basil plants cohabiting the container. Looks like I’m going to need to stake the plant soon though. 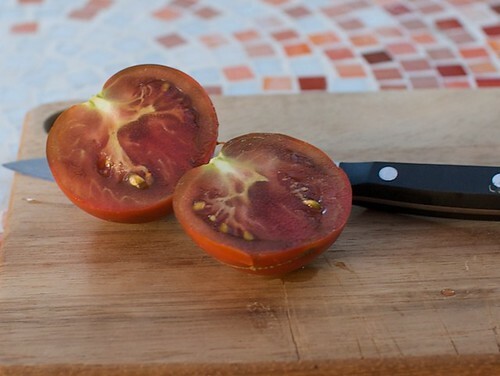 There are already a handful of blossoms on the plant and you know what the blossoms lead to: tomatoes! I guess fertilizing plants really does do good things to it. Who would’ve guessed?